Long-sleeved shirts help protect the workers who harvest our food from the dangers of pesticide and heat exposure. Please join REO in donating new or used long-sleeved shirts of any size for men, women, or children. They do not have to be new – gently used shirts are appreciated. In addition, brimmed hats or caps for workers to wear in the fields are gladly accepted. If you would like to make a donation at anytime during the year, please call any of our offices for more information or to arrange a donation pickup. Please join REO’s campaign and help us reach our goal of $1,500 and 100 donors! Tell your friends and family members about the important work we do! Ask them to join us in helping to make a difference. In May, visit www.greaterhelenagives.org and make a donation to us and/or to any of the great participating nonprofit organizations in our state. Support REO and become eligible for great prizes by entering the 24rd annual Montana Shares Raffle. Montana Shares is a partnership of nonprofit organizations working to build better communities across Montana. 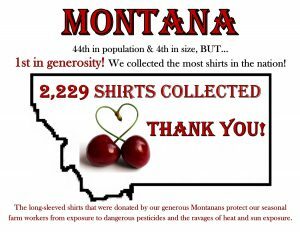 Contributions to member groups are made through Montana Shares each year during statewide workplace giving campaigns. All donations to the raffle support Montana Shares in its efforts to helping REO and other nonprofits diversify fundraising and raise public awareness. Contact any REO office throughout the state to purchase your tickets!